Blog > Beyond the Backyard > I Found My Nemesis Bird: Merlin! I woke up early this morning, so I headed to the Lake Apopka Wildlife Drive for some much-needed me-time. After my last experience birding Lust Road, I made sure to spend lots of time scanning the entrance gate area with my binoculars. There are so many great birds there! Then I drove around the wildlife drive and found my nemesis bird: my lifer Merlin! My first bird of the morning was this Blue Grosbeak. I first spotted her in a tree at the Lust Road gate entrance, before the sun was really up yet. Then later I found her again hopping in a clump of grass. If you’re wondering why the Blue Grosbeak isn’t blue, well, this is the female. She has blue on her wings, but she’s not blue all over like the male. The sky was raining robins this morning. 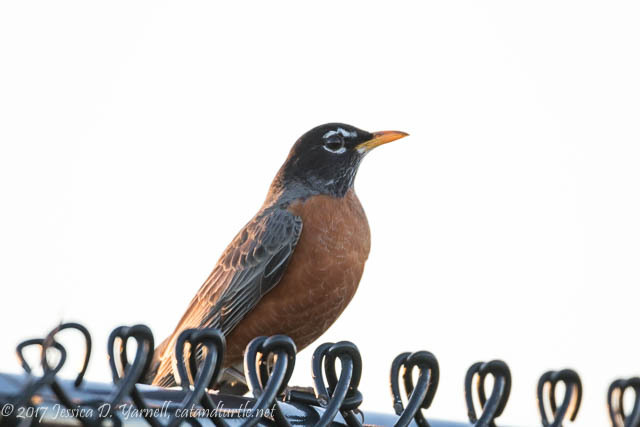 Large flocks of American Robins repeatedly flew over the road, filling the air with their cheerful calls of spring. They are getting ready to head back north. One landed on the fence and watched me looking for sparrows. 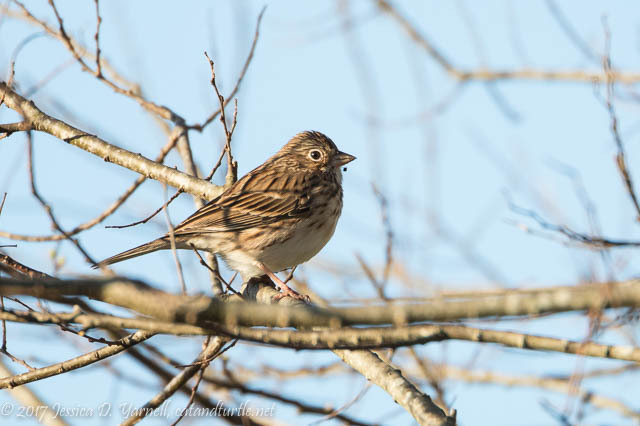 I’ve been on a quest for a Vesper Sparrow for a couple of years. I know they are at the Circle B Bar Reserve, but I’ve never found one. So I was excited to turn around and spot a pair of Vesper Sparrows in a tree at Lust Road. The birds didn’t seem to mind the large crowd of birders. 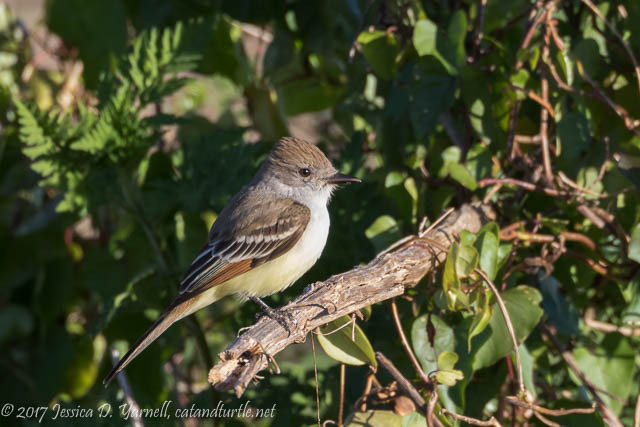 The most popular bird of the morning is the continuing rarity, the Ash-throated Flycatcher. I spotted the flycatcher several times this morning, flying over the fields, hanging out in his favorite tree, and finally landing in some low bushes on the opposite side of the berm. It was the closest I’d been to him, and I got my best shots yet. 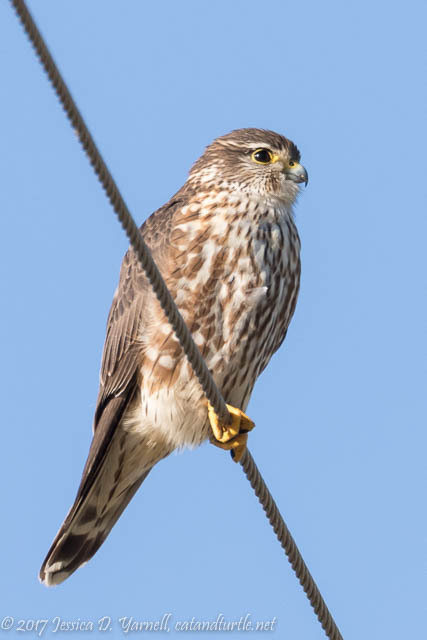 My Nemesis Bird: The Merlin! After gawking for some time at the Merlin, I continued down the road towards the pump house. Out popped three river otters! 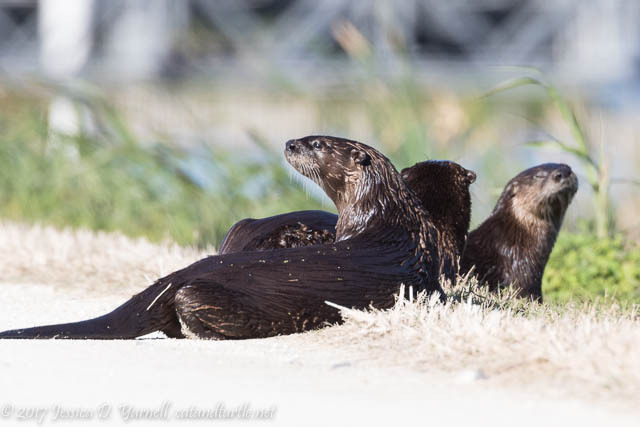 Why did the otters cross the road? To run away from my camera? After the pump house I started seeing ducks. 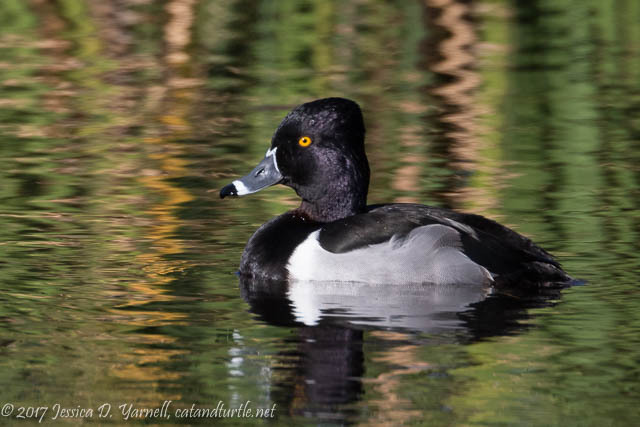 Ring-necked Ducks and Blue-winged Teal were the most prevalent, besides the coots of course. The ducks are pretty when they are swimming in the water that reflects the plants above. I walked one of the berm roads and got some of my best duck shots as the ducks were in flight. 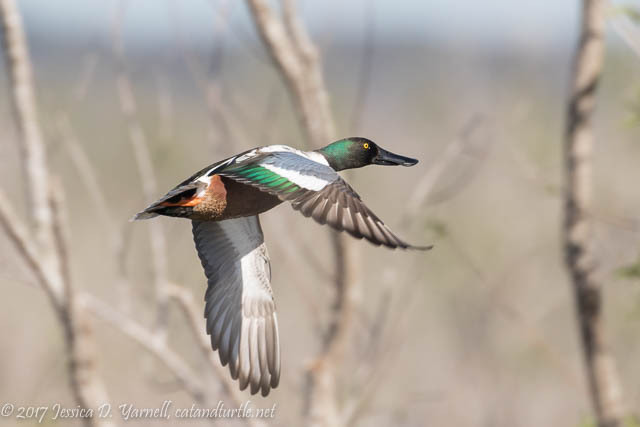 I definitely recognized the Northern Shoveler and was happy to catch him in flight. 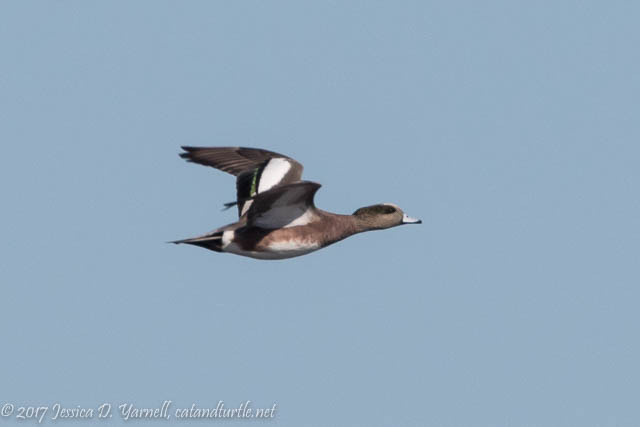 The American Wigeon was a surprise. I photographed him far off in flight, and I didn’t know what I had until I got home. It was 11:00 and time to head home. It was such a nice morning! A beautiful day full of sunshine, a breeze, and good birds. Fabulous shots my friend! So often I see stuff and don’t know what it is. Found a few images in your post that are in that category, so thanks. LOL. Can’t wait to catch up with you soon for some shooting!! 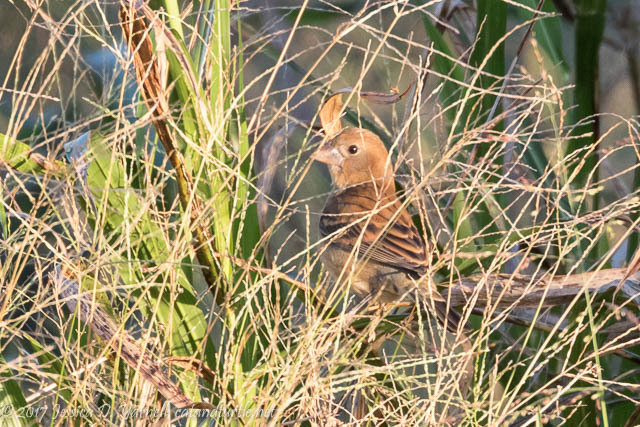 Congratulations on spotting and successfully photographing the elusive bird! It must be so rewarding to be able to recognize all those birds and know exactly what you’re photographing. I’m always taking pictures of birds and, when I’m lucky enough to get a pretty good picture (nowhere close to yours! ), then it’s back to the bird books to see if I can identify one. Alas, I have a very bad memory so it’s challenging for me to recognize all those birds. I guess practice makes perfect! I did spot a downy woodpecker last week, which I had never seen in the wild, and that was exciting to me, although I wasn’t able to get a good shot of it. Thanks for sharing your gorgeous pictures… and I’m glad you had a successful and relaxing “me” time! Thanks Nathalie! You’re right, practice makes perfect when it comes to bird IDs (and photography, too!). I’ve seen otters out there the past three times I’ve been there, so you and your kids should definitely try again. LOL, Wally, you’re too much!